without complaint and even asked for some instruction beyond the initial safety tips. If you knew him, you would understand this to be a quantum leap. I’m quite proud of him, even with the thinner wallet. 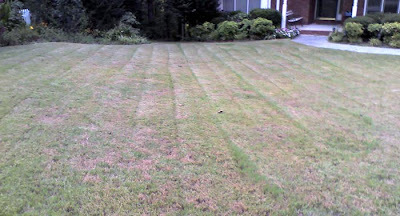 The lines are not exactly straight, and little tufts of grass are visible where he didn’t quite line up the mower correctly on the following pass. There’s also a couple curves where function (the shortest distance between two points) won over a sense of the parallel art that he will hopefully someday come to appreciate. For a first attempt on a very humid morning, I’m not faulting him. I can find fault in other places, however. I took Brian to Freshman orientation at Sequoyah High School, a well regarded school in all measurements, and where my daughter has attended for two years. The orientation was held in the gym, and due to the crowd size, the flow of people upon entering led us down to a lower set of bleachers. That, as it turned out, was a good thing. It seems to be where the well behaved people sit. Up above us was a very loud chattering of students, obviously enjoying their reunions despite the start of another school year. The problem was that this continued while the Principal (or Asst. Principal, I’m not sure) and other speakers were speaking. I guess I’m disappointed. I was quite surprised that, aside from holding a title, he also held a microphone and didn’t take some control of the audience. Perhaps he felt uncomfortable speaking in an authoritative voice when there were so many parents present. I suppose common courtesy can't be expected anymore, but it certainly can be requested, if not demanded in a particular setting. As most students were accompanied by their parents, I’m also disappointed in them for not keeping their kids quiet. I’m certain that many in the rear could not hear what was being said due to the chat and laughter. I have a suspicion that the parents were talking as well. Both of those relate to purpose. They presumably were attending for information, but at the same time were conducting themselves in a manner where they and those around could not hear. But that wasn't the worst. When the speaker made it clear that he only had a few more comments, quite a number of parents stood up and began walking up the steps to find their kids’ homeroom classes, even those that sat at floor level directly in front of the speaker. A few rise, a few more rise, the majority rises, and the speaker was forced to conclude in short remarks, because an exiting audience talks even louder. Whether I'm becoming a grumpy old man or not, I can't see this in any light other than as a valid conclusion. The parental behavior was rude, disrespectful, and a poor example to the kids, who will be asked to submit to the same authority that their parents just ignored. It’s kind of like the thin stretches of uncut grass that escaped the mower. Some can’t follow a straight line, and they’re conspicuous for those that do. Unfortunately, those are typical reactions. Those same parents who couldn't control their children will demand that the school and authorities control them. Those same parents who were talking and ignoring the instructions and information given, will complain the loudest that "they didn't know" when it comes back to bite them in the backside. And the pricipal will never quiet understand why he the kids won't show him the respect he is entitled to. Overall, sounds like the typical start of another school year. UGH... People like that bother me. I have a tendancy to be a chatty mom and talk to the crown but when a speaker start, you shut the heck up. Kudos to you for raising your children right. *sigh* I can't believe Jackie is dating... random I know, but I am still flabergasted.